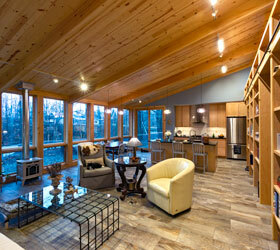 Jay Eckert Construction is a close knit design and build company. We believe our integrated approach and our commitment to working one-on-one with our clients, provides the essential space for the creation of great homes. We are also confident when we say anything is possible, and we delight in the opportunity to creatively explore all the options. As custom home builders, we focus on creating functional and vibrant homes uniquely adapted to our clients. We believe great homes have a personal nature and seek to craft buildings that reflect and enhance the ideals & lifestyle of their owners. As new home builders, Jay Eckert Construction has always focused on Quality, and that is more than a simple sales pitch. It has been our guiding principle for the 37 years that we have been in business. Over our many years of experience, it has been a question that we have constantly come back to. What is it that makes a home valuable? Is a good building more than the sum of its parts? Can it have life? Personality? Soul? Can it enrich and enhance the lives of the people connected to it? We definitely believe it can. But it involves more than a single step along the way. It is a whole process that requires attention to detail in every facet. Throughout the years and the large number of homes that we have made, we have come to find that an integrated Design & Build process provides the best way to create buildings of the highest quality and value. We believe that there are several reasons why (visit our Design & Build page for more details). But for us, the cornerstone of our Design + Build process is a holistic focus on the entire project from conception to completion. We want to be engaged in each stage of the process and we want the responsibility that comes with it. Intimately involving designers and builders in the whole project allows emphasis to be placed on the best overall result and allows that result to be tailor made to all the relevant conditions. Instead of a race to the lowest possible upfront cost, or a focus only on the design irrespective of budget, each step of the process is centered on achieving the best building with the resources available, and each individual part is afforded an opportunity to inform and refine the overall vision. This direct engagement allows for things to unfold naturally and it allows space for adaptation and flexibility all the while seeking to safeguard the integrity and value of the end result. In home building, process is very important. Each step is informed by and builds upon the previous one. 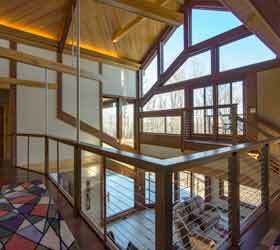 Today, modern construction is often fragmented. For example, it’s not hard to find new home builders of limited building experience who are almost entirely focussed on organizing and hiring a crew of subcontractors. These home builders will often have several standard plans that they offer based to a large extent on how quickly and easily they can be built. Each sub contractor is in turn given responsibility for only one small piece of the project and is often under tremendous pressure to cut costs and to finish their part as quickly as possible. While the intention is to reduce the upfront costs, it also has the additional consequence of disconnecting the people who are actually creating the building from the overall vision and the integrity of the whole. It is a process that is by design insensitive to feedback and the specific conditions and circumstances of the individuals involved. To be fair, this process can help to reduce the initial costs of a new home, and the repetition that comes from focusing on one task can increase the efficiency and skill of certain operations. But often the disconnect and lack of vision is palpable and the real costs are apparent in the end result: rows of very similar and unimaginative homes, at odds with the environment and their occupants. Homes that are built as quickly and cheapy as possible by people who, though the process of construction itself, are disengaged and disconnected from the end result. There is a better way to build. In contrast, we are very much a custom home builder / designer. 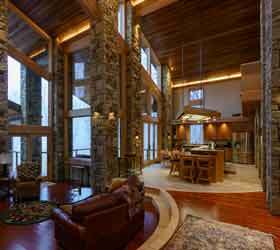 While most home builders say that they offer custom plans, typically they only offer a few variations on some pretty standardized layouts and construction techniques. We don’t offer standardized home plans. We want to come out and meet you and really understand your goals and expectations. We want to make the site as big a part of the design as possible, to harness the sun and the wind to improve comfort, lighting and energy efficiency. To essentially craft a building that tries to take advantage of all the specific conditions of you and your location. We feel this provides the best bang for the buck; not in some mass produced standardized sense but in a personal / creative one. With that end in mind, usually the first step for us is to schedule a meeting with a potential client, and hopefully visit the site and really talk over the details. From there, if we both feel like we would work well together, we create an initial proposal that includes an overall budget for both the proposed construction and design. This initial consultation and budget proposal is free of charge. Moving forward from the initial proposal, the design generally unfolds in four stages. The first is the initial concept. Initial pictures, feature lists and sketches give rise to a working model that articulates the basic massing, layout and construction type. There can often be several concepts as we work through different ideas and try and tease out the essential elements. The second stage takes a concept and refines it by working through the nuances of layout and features (kitchen, baths, individual rooms) and the details of windows and doors, materials and finishes. These features typically work to modify, inform and hopefully strengthen the initial concept. 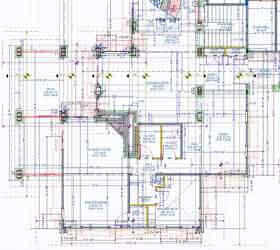 The third stage works to create the construction drawings that solve the technical engineering issues and generate a set of printed plans that can be submitted to the building inspector and used to create the building in the field. If pursuing a design/build, the fourth stage involves a fine tuning of the overall design and effect as the construction itself unfolds. Sometimes conditions in the field differ from what's anticipated, or a previously overlooked feature is discovered through the work itself and/or materials are changed based on new information and feedback. In our design/build process, these subtle changes are constantly adapted to preserve and enhance the overall vision. Overall, the design is a continuous process of refinement from the general to the specific. As the design unfolds, each stage allows for a more detailed understanding of the project and increasingly accurate and fined tuned cost projections. You can really only know what something costs in detail, if you know the details of how and what it is you’re building. As much as we’d like to remove all uncertainty upfront, the process of really customizing a home requires a certain openness and flexibility. While this uncertainty can be intimidating, we work hard to be as open and transparent as possible. Typically after the third stage of the design, it is possible to create a firm estimate with a fixed price, until then, the initial estimates are true to the nature of the work and unfold along with the design in increasing levels of detail. We strive to make our building process as integrated as possible. We take great pride in the buildings we create. We want them to be life affirming and engaging, not only for our clients but for ourselves and for our employees. We believe that quality workmanship is strengthened and enhanced through a connection and appreciation of the whole. We look to instill a sense of responsibility and pride in our workers and subcontractors and we believe that a dedication to doing things right and with uncompromising quality is based on a sense of ownership and connection. If you have time, we would encourage you to visit our Projects Page and read through some of the details. We feel that these case studies provide the best sense of our construction process and some of the thought that goes into it. In terms of the overall timeline, typically the more time there is for the design, the better, but for a new home we generally find that the first three stages of the design take between 2-5 months to fully develop. 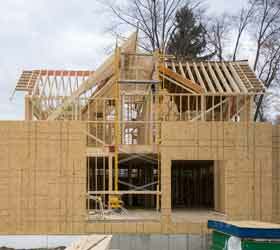 Depending on the scale of the project, construction of a new home can vary substantially. While each new house we build is a custom creation focused on the needs and circumstances of our individual clients, we believe there are often several simple themes that are common to great homes. As custom home builders & designers, we attempt to instil the following elements in each of our homes.